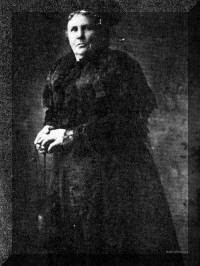 2-Elizabeth Walker was born on 1 Jul 1853 and died on 10 Oct 1917 at age 64. Elizabeth married her first cousin Samuel Goss, son of John Goss and Ann Ayres. 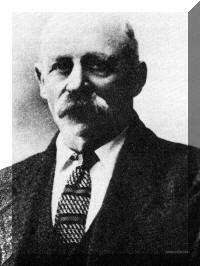 Samuel was born on 15 Sep 1855 in Westbury, Tasmania and died on 23 Sep 1946 in Wynyard, Tasmania at age 91. Samuel Goss, sixth son and sixth child of John Goss, married Elizabeth, 11th child and fourth daughter of Michael and Sarah Walker. They lived at Liffey for some years, but later moved to Barrington. Statements and records are not in full agreement as to which of their family were born at Liffey and which at Barrington, but there does appear to be substantial agreement that Elizabeth led a hard but capable life. It is said that she lived in a rented house all her life, and that she used to catch rabbits to help to make ends meet. She was a hard worker, particularly in her vegetable garden, where she was consistently successful; she also had a good flower garden, which is still remembered for its borders of pansies and violets. During one particularly hard time Elizabeth's brother-in-law, Isaac Richardson, provided a wagon load of provisions; whether other members of the family also helped is not known, but it has been asserted that after moving to Barrington, Elizabeth had no further association with her family. She successfully raised a large family of her own. Her first child, Olive Ann, was born on 24th November, 1882 and was baptised on 14th January, 1883; Francis Michael was born on 4th November, 1883; Ethel Elizabeth on 1st March, 1885; Hector Leonard on 7th January, 1887 (baptised on 22nd April, 1888); Henry Herbert on 24th November, 1888 (baptised on 20th July, 1889); Arthur Ernest on 23rd January, 1890; Lambert Gordon on 22nd October, 1891; George on 27th December, 1893; Alfred James on 18th September, 1895, and Ruby Maud on 1st September, 1900. 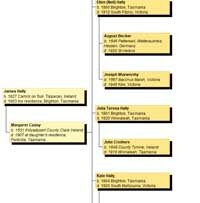 Six of Elizabeth's sons fought in the Great War of 1914-1918, and all were wounded; all ultimately returned to Tasmania, but Elizabeth had died on 10th October, 1917 prior to their arrival. The committee responsible for this book has experienced more difficulty in coping with contradictory or vague statements about the Gosses than it has encountered for any other branch. Odd scraps of information are still coming to hand, such as an assurance that Harry, Arthur and George were all good footballers, but there are still many gaps, and a certain amount of revision may well appear when supplements to the book are issued. Samuel Goss, "Old Sam", emerges as a somewhat enigmatic figure, concealed to some extent under two or three layers of skillfully applied black paint. It has been suggested that Sam lived at Liffey for a considerable time after Elizabeth had moved to Barrington; see the electoral rolls, which locate Sam at Liffey and Elizabeth at Barrington: on the other hand, see his sons' attestation papers, which all name Samuel Goss as next of kin, and give Barrington as his address. Maybe Sam fluctuated between Liffey and Barrington; maybe he simply wouldn't go to the trouble of filling in an electoral form; maybe he had another motive, such as that which led a cousin to record a false address so that he could vote for his old friend Bob Robertson at Legislative Council elections. It has been suggested that Sam was absent from home for years at a time, as a guest of Queen Victoria according to some, but as yet research has failed to establish anything sufficiently factual to print. Even so, he might still be nominated in contention with Norman Walker for the award of best and fairest black sheep in the family, and, like Norman, derive genuine if sardonic amusement from such a nomination. Towards the end Norman did briefly relax his normal, semi-humorous cynicism to assure son Jack that he was not as black as he was painted; according to Jack a true saying, and worthy of all men to be received. So may it have been with Samuel. By contrast, Elizabeth is remembered without dissent as one of those capable, courageous ladies who worked tirelessly to mould and guide a family, contributing in the process to the moulding and guiding of a nation. Her whole married life bears witness both to the worth of Sarah's upbringing and the worth of her own character, no whit inferior to that of the matron of ancient Rome, who not only practised all the housewifely virtues, but provided men for the legions. This section closes with an anecdote illustrative of family loyalty. It concerns a prominent personage whose alleged acceptances of bribes has been made the subject of a Royal Commission, and a certain bus proprietor who had turned King's Evidence and been granted a pardon. Scene: Norman Walker's bedroom, getting on for midnight; Norman propped up in bed with The Examiner, and son Jack brewing tea by a blazing fire. Jack replies to a query as to his opinion of "yesterday's shenanigans at the Commission" with more candour than discretion. "Now hang on a moment", says Norman "he married a Goss from beyond Quamby Brook, and they're our second cousins. And while he may have had to pay out money to keep his business together, I don't believe for one moment that he'd tell lies in court". The prominent person was acquitted. Norman, not too pleased at the time, was mollified to some extent when Jack passed on to him an anecdote of the House of Assembly, not reported by the press, but vouched for by an M.P., whom Jack knew well. "The fact that a man has been acquitted, thundered a prominent member of the Opposition to a stunned House, is no guarantee that he was innocent of the offence with which he was charged".